Should You Choose Wood as Your Roofing Material? In the past, Toledo OH homeowners had very little choice in roofing materials. Today, homeowners can choose roofing tiles made of materials like recycled rubber tires, fiber cement and metal. They can choose from new variations on standard roofing materials like asphalt shingles designed to mimic the look of slate and shakes. Roofing contractors can also choose the ancient standbys of slate and wood. 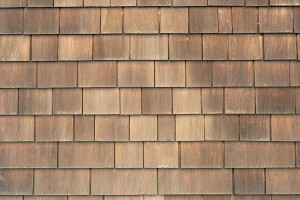 But, should a homeowner choose wood tiles, also called shakes, to cover their roof? Although manufacturers of fiber cement, asphalt, and other types of roofing shingles have tried to mimic the natural beauty of wood tiles, none has been able to accurately reproduce it. Hand-split shakes vary in their thicknesses while those split by mechanical means are more uniform. Because of the natural variations in the wood, each shake has a unique color and texture. Pine shakes start out in shades of light brown while cedar shakes start out with a red tint. The shingles change color as they age, becoming multiple hues of black, brown and gray and giving your Toledo OH home a natural elegance unmatched by manufactured roofing materials. All homeowners are concerned about the impact their home’s roof will have on the environment. The method by which roofing tiles are produced is one measure of their environmental impact. Their overall effect on the home’s carbon footprint is another. The destiny of the tiles after they are finished being a roof also affects their sustainability rating. • They are sustainably harvested. Each tree cut for wood shakes is replaced by another, and trees are harvested at a rate in keeping with the maturation rate of the younger trees. • They are energy efficient. The thickness of wood shakes gives them an insulating value higher than traditional asphalt shingles, lowering the home’s overall energy costs and reducing its energy consumption. • Wood tiles are highly recyclable. At the end of its lifespan, a wood roof can be recycled into other products such as blown-in cellulose insulation. One of the most important selling points of any roof is its life expectancy. Modern wood tiles are very durable and can last longer than the average asphalt shingle. • The wood traditionally used to make shakes is naturally insect repellent, but with today’s treatments, wood roofs are as termite resistant as other materials. • Modern wood tiles are also pressure treated with fire retardant and come in either Class B or Class C ratings. Roofing systems that use Class B wood tiles can be recognized as Class A when they are combined with other highly rated materials and assemblies. • They are naturally resistant to hail damage and wind damage. The combination of beauty, sustainability and durability makes a wood roof a good investment for any homeowner. Call All-Nu Construction today and start the process of remodeling, renovating and improving your home. Find us online at http://www.all-nuconstruction.com/, visit us in Toledo, OH at 5465 Enterprise Boulevard or call us at (419) 242-5568.